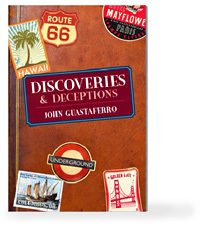 This 60-page E-book contains an incredible collection of close-up magic from John Guastaferro. There are nine card effects, which can be done anytime, anywhere with a borrowed deck—and two non-card effects using a borrowed iPhone and borrowed straw. John also shares insights on discovery that will inspire your thinking. The spectator becomes the ultimate cheater by causing the Ace and Jack to change places while holding one in the card box and the other up his sleeve. A selected card appears is seen in several places simultaneously, then changes into the four Aces, then transposes with a pocketed card. Powerful! The performer and spectator find four Aces together. The magician and spectator both think of the same person…someone from the spectator’s iPhone contact list.